Base of Operations: Darkmoor Castle, England. Powers/Abilities: The Black Baron was capable of assuming a number of forms, each with its own powers. 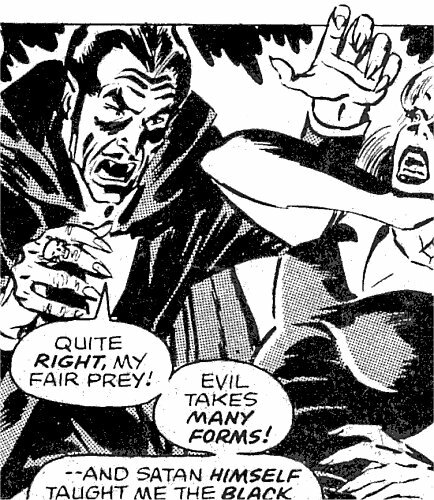 His main form (which appears to have been his true one) was that of a vampire. As a vampire, he could assume the shape of a bat at will, allowing him to fly. He could also cast spells in vampire or bat form. He was seen to animate a suit of armour and transform cat-headed log holders into living beasts. He made a fire belch out choking smoke, could hypnotise with his gaze, and create convincing illusions, such as when he fooled Captain Britain with a false apparition of Courtney Ross. At one point he assumed the form of a gigantic python, large enough to crush a full grown man. His second form, which he seemed to favour for combat, was that of a werewolf. It seemed he could only assume this form when exposed to the light of the full moon, and when in this identity appeared to be driven by a powerful bloodlust. The wolfman had deadly claws and superhuman strength (at least strong enough to rip up lamp posts and swing them like they were twigs - Class 10?). He was also capable of leaping several metres from a standing start. Only silver or good mystical items appeared to be able to harm him - regular bullets didn't bother him. He seemed to be able to command real wolves while in this body. He never spoke in werewolf form, and it may be he could not talk in this shape, although he seemed to retain at least some of his intellect. Nor did he access his other magics in this shape. His third form was that of a normal looking human, his "Roddy, Lord Kemp" persona. This form displayed no special powers, although it was able to go around in the daytime unaffected by sunlight. He commanded a variety of supernatural allies, some of which he may himself have created. His castle was guarded by flying gargoyles, and the crypt entrance was protected by animated skeletons (think Ray Harryhausen). History: (Super Spider-Man and Captain Britain Weekly#235/2, bts) Three centuries ago Rupert Kemp, the 7th Baron Darkmoor, fell in love with a woman called Demelza, and decided to marry her. However fearful local villagers burned her at the stake as a witch. 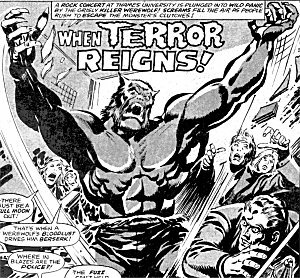 (Super Spider-Man and Captain Britain Weekly#235/2, bts) In modern times the Black Baron's werewolf persona terrorised London with a string of murders on nights of the full moon. The papers dubbed him the "Full Moon Killer". (Super Spider-Man and Captain Britain Weekly#235/2) The Black Baron struck again along the banks of the Thames, but his assault on his latest victim was interrupted by the arrival of Captain Britain. The hero had been specifically patrolling in the hope of finding the serial killer, but was shocked to discover it was a werewolf. After knocking the surprised hero off his feet, the lycanthrope ripped up a nearby lamp post to use as a makeshift club. However the hero's mystic sceptre was more than up to deflecting the attack, shattering the post. Disarmed, the werewolf snatched up his earlier victim, and threw her into the river. Captain Britain dropped his sceptre and jumped in after her. While the hero was occupied, the werewolf attempted to take the discarded sceptre, but it scorched the hellspawn's paw when he tried to touch it. Just as Captain Britain struggled out of the water with the girl in his arms, the werewolf leapt up to the roof tops and bounded away, passing unnoticed directly over a police car which was racing to the scene. (Super Spider-Man and Captain Britain Weekly#235/2, bts) The next day in his guise as Roddy, the current Lord Kemp, the Black Baron visited Thames University, claiming he was considering enrolling in classes there. He met Courtney Ross, a student at the establishment, whom he felt bore an uncanny resemblance to his lost love, Demelza. Striking up a conversation, he invited the young lady to visit Darkmoor Castle. (Super Spider-Man and Captain Britain Weekly#235/2) Courtney spotted her friend Brian Braddock nearby, and called him over to meet Roddy. She informed Brian of Roddy's invitation to her, but as Brian was shaking Roddy's hand, he recognised the ring on Lord Kemp's hand as being the same one which had adorned the werewolf's paw the night before. Brian, secretly the self-same hero who had battled the beast, immediately formed the (correct) suspicion that the Lord and the werewolf were one and the same. However without proof, he felt he could not say anything, especially as revealing his theory would endanger his double identity, so he merely watched as Courtney and Roddy walked away together. That weekend Roddy drove Courtney to his estate, and introduced her to Hugo, his "family retainer", who saw her to her room. The Baron, now in his vampire form, went to his private chamber, where he reminisced about his lost love next to her portrait, and swore that now he had found her likeness again, mankind would not take her away again. Once Courtney was asleep, the Baron entered her room and prepared to turn her into one of the undead. (Super Spider-Man and Captain Britain Weekly#236/2) The Baron's plan was interrupted by his gargoyle castle guards, who arrived at the window with the unconscious form of Captain Britain. The Baron paused in his necking plans, dismissed his minions, and tied the hero up. However Captain Britain awoke, somehow sensing the evil presence, and snapped the ropes binding him. The Baron turned into a bat and fled, with the hero close behind him. They entered the great hall, and as the Baron began his transformation back to human (well, vampire) form, he recited an incantation in his head, animating a suit of armour to attack his opponent. The hero quite literally cut the feet out from under the armour, so the Baron changed back into a bat, and animated the leonine log-holders in the fireplace, turning them into living animals which pounced on Captain Britain. With them pinning his enemy down, the Baron unleashed clouds of choking smoke from the fire, driving the hero into unconsciousness. The Baron revived his opponent and caught him with his hypnotic gaze, making Captain Britain divulge how the he had tracked him down. Captain Britain revealed he had found a book covering the history of the Baron's Darkmoor at Thames University Library. The vampire turned the hypnotised hero over to Hugo, ordering him placed in the dungeon, then changed to a bat and flew off to London. Arriving at the university, he assumed his human guise of Lord Kemp. He entered the library and located the book "The Diabolical History of the Baron's Darkmoor." Then he heard a loud musical beat coming from somewhere outside, and striding to the window, he pulled back the curtains. Outside the full moon had risen, and the Baron gladly gave in to its call. In seconds he had transformed into his werewolf form. He ripped apart the offending tome, and smashed out through the window. He followed the music, which proved to be coming from a nearby rock concert. The beast crashed in, attacked one of the band, and then leapt into the throng of panicing students. (Super Spider-Man and Captain Britain Weekly#237/2) The werewolf rampaged through the crowd until the police, led by Chief Inspector Dai Thomas, arrived on the scene. They opened fire (see comments) but the lead bullets had no effect on the lupine berserker, who lunged forward, grabbed Thomas, and threw him into his men, kicking them all off their feet. Then the werewolf fled before they could recover. The police pursued the wolfman to Regents Park and the zoo there, where the lycanthrope freed a number of wolves from their cages. This provided a diversion to keep the police occupied, but just at that moment, Captain Britain arrived, freshly escaped from Darkmoor Castle. The werewolf sprang at him, only to be batted back by the hero's sceptre. A wolf attacked the hero, momentarily distracting Captain Britain, and in that second, the Baron snatched up a park bench, and hurled it into his opponent's back. With all his enemies stunned or occupied, the werewolf ran off. Captain Britain soon recovered though, and once more flew after his "fearsome quarry", catching up with him finally at Tower Bridge. They grappled on the side of the bridge, then both slipped and crashed into the water. Captain Britain surfaced first, and seeing no sign of his foe, believed the werewolf had perished. The hero took off for Darkmoor, to resume the hunt for the missing Courtney, unaware of a bat which departed the bridge moments behind him. (Super Spider-Man and Captain Britain Weekly#238/2) The Baron, in his bat form, watched as Captain Britain flew off to Darkmoor. Then he too set off for the castle, which he reached just ahead of his enemy. Changing back to his vampire form, he was greeted by Hugo. The Baron took his prospective bride to his secret chamber within the castle, where once he had sold his soul, and there he summoned the visage of his master. Courtney reacted with predictable terror, throwing a lamp at the Baron. The fixture glanced off him harmlessly, and he stepped forward and bared his fangs, informing the girl of his plan to turn her into a vampire too. She fled, ignoring his cry that there was no escape, and ran straight into the arms of Lord Kemp. Her initial relief was short lived though, as she watched the features of the aristocrat warp into those of the vampire. Finally she realised that the two men were actually one. The Black Baron loomed forward, telling Courtney that Satan himself had taught him the "black art of shapeshifting". Once again his plans to bite the girl were interrupted, as Captain Britain crashed his way into the room, and cracked the Baron across the head with his sceptre. The Baron angrily warped into a gigantic python, which wrapped the hero up in its coils and began to squeeze the life out of him. Although his arms were pinned to his side, Captain Britain managed to call his sceptre telepathically, and once more struck the Baron on the head. Stunned, the serpent loosened its coils, and the hero broke free. The Baron switched back to his vampire form, and threw a brazier of hot coals at his foe, but the hero deflected the missile with his forcefield. Getting more desperate, the Baron ripped down a curtain, allowing moonlight to bathe the room, and triggering his change into his wolfman form. The savage beast leapt at Captain Britain, who dived over it and grabbed a silver goblet off the fireplace. The werewolf turned and charged its enemy, but he had managed to fashion a makeshift dagger from the ornament's stem, which he plunged into the beast's chest. The Baron dropped to the floor, apparently dead. In order to make sure, Captain Britain took Courtney back to the Baron's secret room, where he located and burned the villain's blood contract with the Devil. 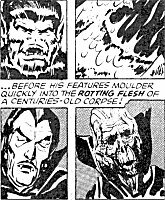 Downstairs, the Baron's body switched from wolfman back to vampire and then to centuries old rotted corpse, before being engulfed in the conflagration that spread to consume the entire castle. Comments: Created by Larry Lieber, Jim Lawrence, Ron Wilson and the Pablos Marcos Studio. There is nothing to indicate if the Baron fell in love with Demelza before or after he sold his soul. As such, I've guessed that the death of his beloved, accused of being a witch, might have been the catalyst for his seeking out Satan to gain immortality and power, unless and until something comes along to contradict this. Hence I've placed her death first in his history. On the subject of selling his soul, the Baron calls his master Satan, and at one point exclaims in Lucifer's name. However the Marvel universe being what it is, the being who empowered the Baron could be Mephisto, Marduk Kurios, Satannish, or even Murray. It's also not entirely clear how his master granted his wish for immortality and power - it looks like they turned him into a vampire as a way on interpreting that wish, but was this a straightforward transformation, or did Satan arrange for him to get bitten? Was he always able to assume other forms, or did that come later, as the centuries past? It's slightly misleading to list Courtney Ross as the Baron's enemy, as he wouldn't have considered her that way. She wasn't too fond of him however, at least once she discovered his supernatural side. When Dai Thomas and his fellow police arrive to deal with the werewolf, they are all armed. A reference is made to "the Sweeney", as if this would excuse this lapse in understanding of the British police force. Dai Thomas had been shown to be an exception to the rule in the past, but in general, the British police do NOT carry guns. Armed response units do exist, but they would not be sent in to deal with a disturbance like this, even for a suspected serial killer, unless it was thought likely the suspect had a gun themself. 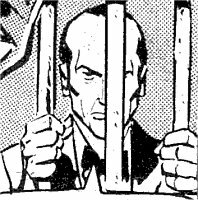 It is good to note though that Dai Thomas is such an efficient cop - every time ANY crime occurs in the original Captain Britain strip, day or night, even when that offence happens outside of London, Dai can be guaranteed to be on the scene soon afterwards, at the forefront of the local cops. In the first Captain Britain story, also set largely on Darkmoor, a comment is made that the reason that Darkmoor Research Centre is located there, is because it is so remote from anywhere else that an accident would only hurt the people at the centre. However in this story, Captain Britain and the Black Baron both commute back and forward between London and Darkmoor a couple of times in one night. Okay, they can both fly, but Captain Britain could at this point in his career only do so for 15 minutes at a time, and the Baron could only do it as a bat, which isn't particularly fast. All of which seems to imply Darkmoor is suddenly a lot closer to London than it used to be. In another feat of stunningly bad writing during this story, Captain Britain decides he can avoid being spotted by the castle gargoyles by disguising himself with leaves and branches. Okay, a bit of camouflage, I might buy. However the hero also states "Not only will these leaves camouflage me, but they'll absorb the 'goodness' that emanates from my star sceptre." What?!? If random twigs and leaves can absorb good magic, this is the first I've heard about it. Dr.Strange better hope Baron Mordo never finds out! "Ah Stephen, you can call on the might of the Vishanti all you want. I am armed with a small potted geranium, which will absorb your goodness, leaving you completely defenceless!" In Blade III#12 a prophecy was fulfilled that brought back all vampires that ever died. This most likely included Black Baron as well. We'll have to wait if he resurfaces. The Black Baron's loyal servant. He was described as "zombie-like" at one point, but there is nothing in the story that suggests he is anything other than a normal human. He showed Courtney to her room when she arrived, and then did the same for Captain Britain when he arrived. Or, more accurately, he took the hypnotised hero down to the dungeons and chained him to a wall. He foolishly left the hero's sceptre in the same cell. The mystic energy from it awoke the hero from his trance, and when Hugo came to the cell door to gloat, Captain Britain used his mental control of the sceptre to smash Hugo in the throat with it, then pinned the servant against the door until he unlocked the cell. The hero returned for Hugo when he could not locate Courtney, and carried the retainer high into the sky above the castle, threatening to drop him if he didn't provide some answers. Hugo quickly agreed to tell Captain Britain anything he wanted to know (after which the hero presumably returned him safely to the ground, as he was seen uninjured the next issue). Hugo later greeted his master upon the Baron's return from London. His fate when the castle burned down is unknown. Centuries ago the Black Baron fell in love with her, and tried to marry her. Unfortunately, the local villagers burned her at the stake as a witch. Although the Baron refers to her as an "enchantress", it is unclear whether he meant this literally or romantically, and so it is possible her death was unjust. The Baron felt that Courtney Ross bore an uncanny resemblance to her. The stone gargoyles which adorned the outside of Darkmoor Castle were able to come to life if they sensed an intruder approaching. They could fly, and possessed the ability to breath fire. Since they were made of stone, they were difficult to injure, and packed a mean punch in return. They overpowered Captain Britain the first time he tried to come near Darkmoor Castle, and delivered him unconscious to their master. They must have been keyed to attack people approaching the castle, not those leaving it, as Captain Britain was able to depart for London unmolested when he escaped from the Baron's dungeons. There was a crypt which belonged to Darkmoor Castle at the rear of the building. Within that mausoleum was a door which accessed a tunnel leading into the castle. 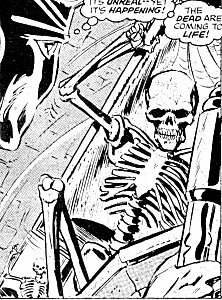 However the Baron had placed a couple of skeleton's in the crypt who animated an attacked anyone trying to use that route, as Captain Britain discovered. Though the undead guardians shocked the hero, he made short work of them.